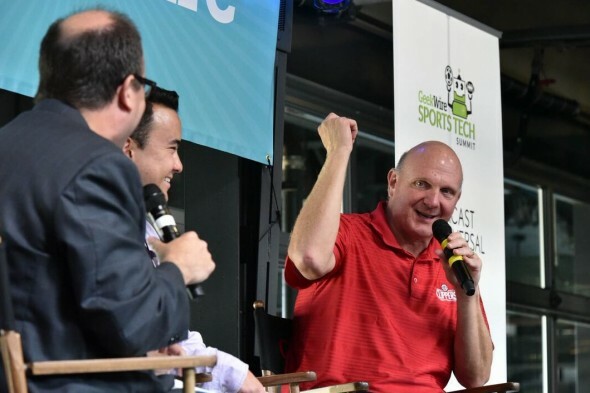 Clippers owner and onetime partner of Chris Hansen, Steve Ballmer told a sports-tech conference that Seattle’s only hope for an NBA return was to go poaching for an NBA team with a short lease. Rarely a speaker known for subtlety from his days at Microsoft, Steve Ballmer laid it out Wednesday for those at the Geekwire Sports Tech Summit who pine for the return of the Sonics: Expansion isn’t on the NBA agenda, so be prepared to poach a team from another market — should there ever be an arena in Seattle. “(Expansion) is just not likely to happen,” the Los Angeles Clippers owner said during an interview with Geekwire’s Todd Bishop and Taylor Soper at the gathering of more than 300 attendees at a Safeco Field concourse. “There has been no discussion about expansion since I have been involved with the league. So, I don’t think that will happen. The league has really moved to favor teams staying in their current markets. “You’d have to find a team that’s at the end of their (arena) lease, where it looks hard to build an arena and where they’ve tried really hard to build an arena. Even though Ballmer’s thoughts may not be breaking news, his explainer had deeper resonance because it came from a) a Seattle resident; b) an NBA owner, not the politically correct commissioner, Adam Silver, and c) the one partner who gave Chris Hansen’s stymied Sodo arena plan the most credibility. Ballmer all but said directly that the vacant Seattle market is a tool the NBA uses to extort public funds from other municipalities. Never is it done in pro team sports to speak about the cudgel of monopoly power wielded by the leagues. But in the eight years since the Sonics decamped to Oklahoma City, Seattle’s void has been used by the NBA three times — in Sacramento, Milwaukee and Minneapolis — to help secure some public funding for new arenas, so the truth speaks for itself. As Microsoft’s CEO, ruthless business dealings were the order of the day. The Sacramento episode in 2013 is notorious in Seattle because Hansen and Ballmer teamed up to offer $625 million to the owners of the Kings in order to move the team, playing in a modestly updated KeyArena until a new building was ready. But new local ownership was found to nearly match the offer, and NBA owners voted 22-8 to keep the Kings in Sacramento. The Golden 1 Center, billed as the world’s most technologically advanced arena, opens this fall. The Kings bid turned worse when Hansen was fined by the California elections commission for not declaring funds given to an anti-arena group prior to a public vote on the arena. Then Ballmer, impatient with the slow process in Seattle, bolted his partnership with Hansen when he saw a chance to buy the Clippers from Donald Sterling, who was suspended from the league after recordings of racist comments he made were released publicly. Seattle’s richest Basketball Jones paid $2 billion, about three times the estimated value, and rocked the global sports market. For Ballmer, it was a no-brainer to bail on the Seattle project. “In my own case, I’m 60 years old and I wasn’t prepared to wait five or 10 years,” he said, then disabused again the rumor that surfaced around the time of the purchase about a move to Seattle. Regarding another NBA matter, the pursuit this summer of free agent superstar Kevin Durant, whose rookie season was in Seattle, didn’t work for the Clippers, even though Durant was said to be “blown away” by the presentation. Asked what he was doing in the room, Ballmer said in his legendary outside voice, “Working hard! Selling our butts off! “I believe wholeheartedly that we were a great destination for Kevin Durant. We wanted to bring alive to him the possibilities. He loves tech. We wanted to show him what it would be like to be THE player associated with the advance of technology in sports. As you may have read, Durant politely declined, choosing Curry and the Warriors — a rare moment in Ballmer’s life where he didn’t get what he wanted. The episode also served as a reminder of one the great ironies in this sports marketplace — that Durant, perhaps with Ken Griffey Jr. the most valued draft picks in Seattle sports history, and two of the city’s billionaire sports titans, Ballmer and Portland Trail Blazers owner Paul Allen, do not operate in Seattle. It’s clear how it all happened, but add them together and one gets a big basketball-shaped zero. It should be illuminated every night, Bat-signal style, over Starbucks world headquarters on First Avenue South. So…………….”NHL-first” it is then! Just like it’s basically always been since the day Hansen’s purchase of the Kings got vetoed. Now who builds the arena for NHL-first, NBA-later? Because that seems to be the issue no one can figure out. Pretty much. Especially since the NHL needs another team out west. So far, Hansen has wanted the NHL owner to be an equity partner in the arena. That’s a real problem for most when he keeps adding pricey public benefits. The overall math is probably a bit different too since the NHL isn’t the TV sport the NBA is. That’s why I get the impression NHL teams generally want to control their own buildings and that’s partially why NHL hasn’t worked out in Portland, Houston and Milwaukee to name a few. It’s true that NHL teams are far more gate-dependent the NBA teams. Should a Hansen arena get built and host an NHL team, I can’t wait for the reaction when he scales the house and discloses ticket prices. And when you add the upfront costs of building the arena (which would include the public benefits), the acquisition of the NHL team and the limited revenue opportunities that may exist from being a tenant in the SODO building, it’s a big number and it’d probably lead to exorbitant ticket prices. Which is probably why an alternative NHL arena site feels more likely at this point if the money ever came on line for someone (perhaps in Tukwila with Ray Bartoszek, for example). Of course, the leagues and other investors aren’t so keen on a location outside of downtown Seattle. So, a whole other measure of chicken-egg. I’m not so tied to going downtown; especially if you have uncooperative local government in Seattle. It just has to be a site that’s accessible to everyone. We’re lucky that Vegas ownership apparently prefers Salt Lake City as its AHL affiliate. So, that city is at least off the table…for now. Gotta figure Portland might still(?) be in the mix, though. Of course, that’d probably mean the demise and relocation of their beloved WinterHawks if they got an NHL through club one way or the other. Really, the options are limited in the western region for the league balancing out at 16 per conference: Puget Sound, Portland, and SLC. Unfortunately, only 1 of the 3 currently has no rink to house a franchise. Hint, hint. SLC and the Jazz recently reached a financial agreement to upgrade their gym, which also can configure for hockey (2010 Olympics) if need be. I get so infuriated at those in Puget Sound who truly believe both the NBA and NHL will continue to wait for this region to pull its head out and get its act together in the face of positive arena news elsewhere around the country. I don’t know there is a hockey culture here in the NW to actually support a team. It would require some serious ticket prices and I just don’t hear widespread, local outcry for an NHL team. And yet, it works in San Jose, Dallas, Denver, LA, Pittsburgh, Washington DC, Tampa, Nashville, etc. So if it can work in those American markets that are either non-traditional or are in that area below NYC and LA in terms of population and corporate dollars, why can’t it eventually work here? You’re right about how the hockey culture would need to grow, but I believe that could be accomplished with hard work and dedication from an ownership group. Seattle has become affluent enough lately to afford hockey’s high ticket prices. As far as outcry, there was not even a murmur for the NBA in the late sixties, and only a rustle in the seventies for baseball. I may be showing my age but I was a loyal grade school, high school fan of the Sonics in the late 60’s. Bob Rule, Tom Meschery, “Crash” Kron, etc, were all my heroes as a youngster. No way was I going to miss a Washington Bullets game – those were all-out BRAWLS, And who could miss a Lakers game with Wilt controlling the lane and everyone booing his every move? Those were the days before the third ref and the “no touch” soft NBA game we see today. The action in the lane was warfare and no one dared to drive in those days without expectation of a least one sharp elbow! it was also the days when a kid with no money could buy the cheapest ticket (until we figured out the door we could sneak in by) and eventually wind up on the lower 10 rows! Kinda like the NBA in Vancouver. We all, and I mean we all, keep trying to raise the dead with a word-or two-or three. You know, like – “Lazarus come forth” only we say “Sonics come forth.” Doesn’t work unless you are God. Silver is nothing other than the little midgets (Stern) protege, only 2 ft taller and 100 lbs lighter.. Ballmer is right. No expansion. And even if there would be, not in Seattle. A theft is also very unlikely…i.e. the Kings. Why? No stadium. Why else? .Politicians. And finally and most assuredly, hi-ho Silver. Ballmer said he will die owing the Clippers. We will die still trying to raise the dead. Let us all live long enough to see Coach Durant guide the expansion Sonics owned by Ballmer’s youngest. I’m so sick of being a “can’t do” city when it comes to this issue. All we have done is studies and reports about a potential arena for nearly a decade now. SACRAMENTO AND MILWAUKEE are getting new arenas and Seattle is stuck with the dumpster fire known as Key Arena. It is a curious thing between Seattle and the NBA. Random events have conspired in unforeseeable ways. Do you think the NBA would go as far to relocate the Charlotte Hornets if there is no change in the HB2 law? No chance. They want Seattle to be the relocation for a long while. HUGE gaping black hole and skid mark, though, that. Considering the way it went down. The lasting impression is NOT in ANY way a good look for the league, regardless how supportive OKC has been since the move. A big problem Seattle has are the leftist Libs who don’t back anything other than homeless rights, bike lanes, Pronto and other “feel good”, NON-essential subjects. When is the last time Murray rode his bike to work? I’d love to have a usage tracker on McGinn’s bike, if he even has one. Even though the Hansen arena, using the transportation infrastructure in place in SODO, is easily the best location for spectators from all areas to attend, the next arena simply needs to be located in a city that actually has the political juice to get it done. From what I can tell, that would be ALL cities bordering Seattle. Bellevue is the most viable, given the wealth and fan base base they had for the Sonics. Then Seattle fans would have the cross-lake commute. I can hear the Murray – Sawant party popping their champagne corks already. An arena is an essential? It is a component of a successful, major city, which Seattle has suddenly become the past 5 years, whether we like the changes or not. One aspect of a new arena would put to bed what to do with the Key, which would either find a new life or become part of a long overdue Center redevelopment. The Key needs to be repurposed. It can’t work for big-time pro sports, which is not a bad thing except that it keeps the city believing the mythology of recycling it again. Without a new arena the Key is the sole large concert venue. I hope whoever operates it is not running a loss for the city. Eventually there may be a solution to redevelop that portion of the Center, but until then as taxpayers we can only hope for more and more concerts and more revenue to the Center. Ballmer could have bought the Sonics from Schultz, and, if Key Arena was such an eyesore that needed to be replaced, he could have paid for a new stadium in Seattle to house his team. All this (assuming 2006 to 2007) would have cost about 1 billion dollars, half of the price he paid for just the purchase of the Clippers, a non-Seattle team. I’m sure he regrets not buying the Sonics back in the day, but are there background reasons, or timing issues, why this purchase never occurred? 2006 was around the time Ballmer took over as Microsoft CEO. In an interview with KJR Ballmer said, “I’m an all in kind of guy.” Buying a team would have distracted from his duties to the company. He bought the Clippers after he left the Microsoft. Ballmer was a Microsoft lifer who became CEO in 2000, but your point is correct: Ballmer knew stockholders would have revolted in 08 if he bought the team while CEO. He did throw in $150M into a proposal to renovate the Key before the city caved during the lease trial. I believe his view that timing on Schultz’s sale in 06 was impossible for him. Since I haven’t seen one in this posting, I’ll volunteer to be the one that yet again condemns Schultz for being such a turncoat. No long term Seattle leader would have EVER sold to an out of town owner without a non-relocation clause. Howard will always be a leading luminary in the Seattle Sports Hall of Shame. Howard never would have had his price with a non-relocation clause. Would have lost all his leverage. I quit my long term Sonics season tickets when I realized there were no players on the floor who were being paid LESS than $5 million. Having to watch the NBA games where the players get serious in the 4th quarter just became too much to stomach, especially for an ordinary Joe like me. I have zero interest in an NBA team in Seattle and have simply spent my money on a product where the players put out – Husky sports. Volleyball, football, softball and BB are all Husky sports I follow and support. Many sports fans have thresholds beyond which they will not go. Fortunately for pro team owners, many more fans check their brains at the door and use only adrenal glands. Thanks, Steve, for driving home with a vulgar display of power the reminder of David Stern’s meddling in your joint deal with Chris Hansen to purchase and relocate the Kings to Seattle. Didn’t he step in and move the clock back to allow Mayor Johnson bonus time to cobble together local investors BEFORE the agreement reached the Relocation Committee? I can’t recall ever seeing a commissioner in any sport do that before. The recent SCC Occidental vacation decision might’ve been the final nail in the SoDo proposal, but, the interference from Stern’s Black Hand before that can not be overlooked. Had the Maloofs never backed out of the deal then there would be no Chris Hansen deal to speak of. The Kings were never Seattle’s to begin with. I’m not overlooking anything. But, you’re forgetting the Maloof’s stonewalling about selling to local ownership, for whatever reason. THAT’S when Hansen-Ballmer stepped in, regardless of any sweet deal Sacramento City Council might’ve come up with. And, THAT’S when Stern interfered. AFTER they had an agreement with the Seattle investors. Just as Stern “assisted” Sacramento’s effort to keep its team, he was no less instrumental in the poaching of Seattle’s by OKC. As I recall, the Sacramento arena plan wasn’t finalized until much later after the Hansen/Ballmer offer was on the table. And Mayor KJ had yet to secure financing. Stern and the NBA had enough commitments of cash, and the city council’s yes vote prior to the relocation vote. The details came later. Enter David Stern. That has been my point all along. Sacramento had an arena plan in place as of March 6, 2012. It was non binding with an official vote to be made soon thereafter but the Maloofs backed out of the deal the following month. The Maloofs parlayed an out of town offer against desperate city govt and a willingness by Stern to avoid relocation. Hansen/Ballmer were used. Exactly – can we spell “leverage”? I have not forgotten how the Maloofs said the team was not for sale in April 2011 when Burkle’s name was dropped by KJ. They tried to hold onto the Kings in hopes of moving the team to Anaheim. Burkle was not going to overpay for the Kings or any team. I recall Sam Amick was the first to report that the Maloofs asking price in private was around $500 million plus and only one person was desperate enough to pay the price which turned out to be Chris Hansen. My point was if the Maloofs were not NBA broke then the 2012 arena deal would have went through and there would not have been the Seattle-Sacramento fiasco. The fact that the NBA fronted the money for the Maloofs spoke volumes and their days as owners were numbered. Yes, Hansen had a deal with the Maloofs but it was always pending to NBA approval. With an NBA approved arena deal in place all Sacramento needed was an ownership group to step up and make an offer to keep the Kings. Stern was the biggest hero in saving the Kings. No argument from me on that. As far as Seattle losing its Sonics I would put the most blame on the politicians of Seattle and the state of Washington. Speaker Chopp told Stern and the NBA to basically kick rocks. In hindsight, Stern would have done anything to avoid another relocation near the end of his term. Better to screw Seattle twice than have Sactown and the hoops nation ream him again. Great to finally hear from Ballmer some of the details of his partnership with Hansen and his opinion on what Seattle must do to get an NBA team. In fact it’s so candid if David Stern was still commissioner he’d probably fine Ballmer for saying Seattle must poach another franchise. Sadly, I don’t see that happening any time soon and I don’t understand why the. NHL has to enter the equation. You’d think the NBA wouldn’t want competition for a city’s sport dollar. If the NHL comes first, the NBA doesn’t care. They’re doing fine without Seattle. i consider this to be interesting timing on Ballmer’s part, saying this in the wake of the NBA free agency feeding frenzy. with the spike in the salary cap, NBA owners just saw the cost of labor go up about 30% – but that doesn’t necessarily mean each club’s individuals revenues went up the same amount to cover those costs. owners are going to find out (if they arent already doing so) that the supposed panacea of new TV money isn’t going to solve as many problems as they would like. that imbalance will still be there between big and small, and the costs of doing business and trying to compete are going to get steeper and steeper. because of this, i suspect the small market clubs will try and force the commish to reopen the labor pact and force concessions out of the players union. how that goes may, in fact, determine if clubs are available for sale. i can already think of several bad teams in bad markets whose financial stability is marginal, at best, and poaching one is not impossible if trying to redo the labor deal turns out to be a non-starter and several owners decide to throw in the towel. in short, i think there is a good possibility that an NBA team will be for sale in the future, and possibly more than one. leases complicate matters, but leases can be broken if there is will, and have been broken before. this may take a few years, of course, which is not what any Sonics fans want to hear, but I dont think its impossible by any means.